Unlike traditional car rental companies depending on attracting car rental users from car sharing, DiDi is using its huge customer traffic to find the best sustainable business model. Apr. 12, 2019 /EqualOcean/ - DiDi’s sub-brand Xiaojuchefu (小桔车服, Xiaoju Auto Service) officially announced that DiDi users in Shenzhen, Changsha, Zhuzhou, and Xiangtan cities can use DiDi Car Sharing service without paying the deposit. DiDi Car Sharing set 60 pick-up points in Shenzhen and 40 pick-up points in each of Changsha, Zhuzhou, and Xiangtan. 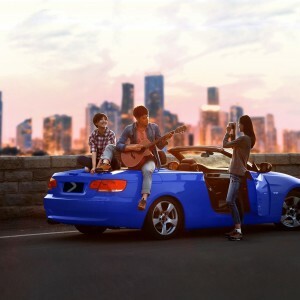 Chinese largest car rental company, CAR (神州租车), launched its car-sharing business in 2018, and at the end of 2018, the car sharing coverage expanded to 36 cities from different tiers. DiDi Car Sharing has stretched into 10 cities since 2018. Both DiDi and CAR launched the car-sharing service in 2018, but CAR had long been practicing car rental business. CAR initiated the car-sharing service to effectively use the not-in-use rental cars, and according to its 2018 annual report, nearly 30% of carsharing users converted to car rental users. Car sharing is an extra entrance for CAR to acquire customers. The situation is different for DiDi since DiDi is a car-hailing company and it has served over 500 million customers in past practice. DiDi’s car-hailing services generated CNY 108 million (USD 16 million) losses in 2018 but its user traffic outdoes other car service providers or platforms. In Analysis’ report, DiDi has an absolute leading position in customer base because the DiDi’s penetration rate of active users maintained in a range from 8% to 12% from January 2017 to May 2018, while others stayed below 2%. The massive user traffic and high penetration rate are favorable conditions for DiDi to expand car rental and car sharing business. Based on the already-built customer pool, the car rental service is a function added to the original ride-hailing service instead of access to attract more users, though it might have the ability as well. The main goal to add car sharing and car rental services is to actively and effectively utilize the traffic and diversify DiDi’s income sources by building a multi-dimensional ecosystem with featured auto services from financial to auto care. Back to the four cities, three are in Hunan province. In Hunan, CAR has 166 pickup points distributed in 16 cities dated the article published. DiDi opened 120 pickup points in three cities, which has denser pickup points in each city comparing to CAR. In Shenzhen, Shenzhen has 75 CAR pickup points while Guangzhou has 202 CAR pickup points. DiDi Car Sharing did not choose Guangzhou to launch the car sharing but Shenzhen with 60 pickup points. Though it is interesting that DiDi chose three cities from Hunan to launch the car sharing business, the siting selection is reasonable. Avoiding a competitive market in Guangzhou, Shenzhen, which is a tier-1 city, is more ideal for DiDi to start the business that the market is not fully developed.